Moona Baig is the founder of Moona Baig Celebrity Brides, Urban Goddess by Moona Baig, DTV Studios, Celebrity Brides, she is a highly regarded professional make-up artist who has worked in industry for the last 27 years. She has authored various articles, and created diverse looks for Film, TV, Radio, Magazines and Fashion Shows. Her associations can be found with television and media companies as prestigious as the BBC and advertisers as world famous as De-Beers. Make-up, Confidence Building and Image. Previously BBC''s Fashion and Beauty expert. She is also authoring a book by the name "Nobody''s Perfect but You!" Her belief that anyone can have model/actor looks with the right make-up, styling and grooming. "Beauty" she says "is very much in the eye of the beholder!". With such an inspiring thought. We can only watch and learn as Moona beholds! Now as Head of Professional Makeup Services & Training at Moona Baig Celebrity Power you can ensure with leadership like hers you are guaranteed the best experience of your life. As Celebrity Head Trainer she will be looking to create a storm in the industry revolutionising training and introducing cost effective courses as well as helping you to create full careers within the makeup industry. Services You will find all our services ranging from TV, Advertising, Photoshoots, Bridal Make-overs, Personal Make-overs... Plenty for all! In Training you will find our Make-Up Artist Training programmes: Whether you are looking to learn make-up techniques for your self or looking to work in the Make-up Industry you will a course to suit your needs. Makeup Artists Available Seherish is Moona Baigs PA and Senior Makeup Artist available to book. Articles & Advice You can read some selected Articles here and read the advice given to your letters and emails. Products that you can buy. As of 1st August 2010: DTV Studios and Urban Goddess by Moona Baig studio and magazine ceased to exist. All images under Moona Baig Portfolios remain the sole rights and property of Moona Baig. 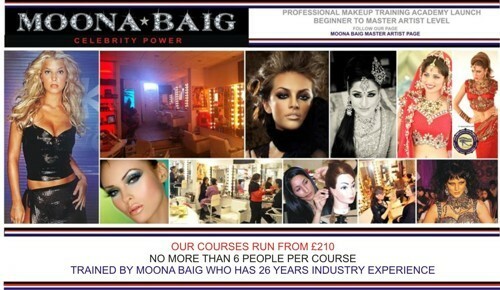 As at 1st November 2013 Moona Baig is the Master Artist & Trainer at Moona Baig Celebrity Power Ltd. this website belongs to Moona Baig Celebrity Power Ltd except Makeup Artist Portfolios which belong to the respective artists! Note: All images contain Artist information! This will not affect the the way we do business, hopefully it means that you can see a bigger and better more organised business as a result.